Devotion, dedication and discipline are the keys that unlock the doors of opportunity to the future growth and progress of our nation. Patriotism is instilled in the minds of the students by celebrating the National Festivals- Independence Day, Gandhi Jayanthi and Republic Day with an absolute feeling of nationalism. 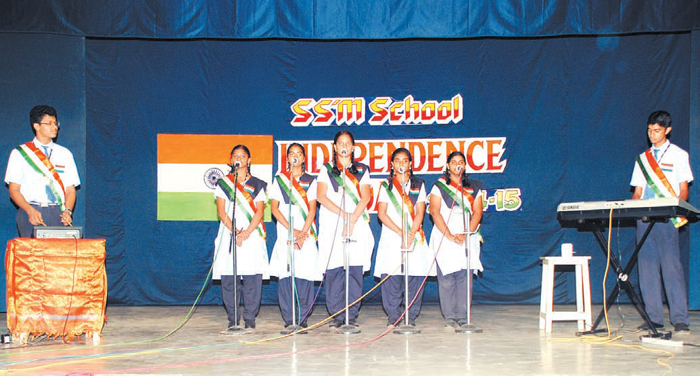 The Independence Day is celebrated on 15th August every year. It is a day of dedication to the martyrs who embraced the gallows to sacrifice themselves for Mother India to be relieved from the British tyranny. The National Flag is hoisted to commemorate the day of huge significance and the day continues with festivities to honour the nation. The birthday of the Mahatma- the upholder of Peace, is celebrated on 2nd October, every year. In the function, students recall the Gandhian thoughts and eulogise the “Father of the Nation”. The Republic Day honours the date on which the Constitution of India came into force on 26th January 1950. The students take pride in glorifying and celebrating the spirit of unity. The campus reverberates with patriotic fervour and gaiety. The students commit themselves to promote fraternity. They solemnly resolve to be a part of the Sovereign, Socialist, Secular, Democratic, Republic.